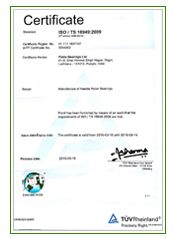 Pabla Bearings Limited are the manufacturers and exporters of high quality ISO standard bearings range for automobile bearings and industrial bearings like Welded Cage Bearings, K, KZK, KBK Bearings, HK, HF, DB, DBH Bearings, Needle Rollers Bearings, NK, NKI, NBI, NAI, UJ Cross Bearings, RNA Bearings, DL, JL, MF, MFY, FY, F, SCF Bearings, HUB Pins, Needle Thrust Bearings, Ball Bearings. we also manufacture bearings for OEM standard companies in India. Pabla Bearings Limited successfully carved a niche for itself in the realms of precision bearings and auto components for two, three and four wheelers. Pabla Bearings Ltd. is and ISO / TS - 16949 certified company synonymous to conceive highly sophisticated precision bearing through superior quality and functional design. We are engaged in manufacturing of precision Needle Roller Bearings, Ball Bearings, Thrust Bearings & Auto Components. We are also specialized in manufacturing the bearings for Textile and General Industries. We have achieved excellence in the National and International level, some of them being OEM of our precision bearings. The spirit of this backdrop is our highly qualified engineers and professionals. We are committed to manufacture and supply products that adhere to contractual specification and satisfy customers in terms of consistent quality, competitive price and timely delivery. We are committed to comply with requirements and continually improve that effectiveness of quality management system. 1.State-of-the-art-manufacturing of precision needle roller bearings through stringent & planned quality management system. 2.Satisfaction of customers through precise and quality product & close co-operation with customers. 3.Continual improvement & up gradation in the manpower and machinery. 4.Increase in the market share providing quality products at competitive cost. All production facilities follow good manufacturing practices. The state of the art plants for Heat Treatment, Tolerance Test and Final Assembly are done by well experienced technical staff. we as a automotive engine bearings manufacturers & exporters offering a wide array of Needle rollers pins that are high in performance and help in smooth working of the machinery. pabla as a manufacturer of automobile bearings we produce high quality Needle Thrust Bearings for heavy vehicles and small vehicles. Our thrust bearings are known for high capacity and durability. As a manufacturers and exporters of all types of bearings we offer Turned Cage Bearings and Welded Cage Bearings in different range, sizes, etc. Our ultra modern infrastructure for manufacturing of needle cage bearings ensure high quality and efficiency of bearings. Durable as well as precision made, these hub pins are available in different diameter sizes, from broadest sizes to the most narrow ones. we offer 3 wheeler hub pins like Ape hub pins, Bajaj Hub Pins, Classic Hub Pins, Legend Hub Pins, LML Hub Pins, CNG Hub Pins etc. 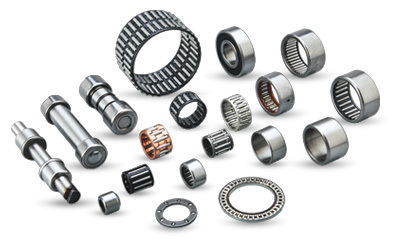 Pabla Bearings are manufacturers and exporters of all types of bearings and auto components like two wheeler bearings, three wheeler bearings, four wheelers bearings, automobile and automotive industry bearings, general machinery bearings, power & transmission system, agriculture machinery bearings and for textile machinery bearings.